The housing boom further increased our economy’s bias against business capital, but by 2010 housing profitability was back to normal. Last week I examined a measure of the profitability of housing capital: the value added by houses in the form of shelter and convenience for their occupants during a year, expressed as a fraction of the total value of homes. Before the housing boom, housing added much less value per dollar than business capital did, largely because business taxes restrict the supply of business capital. The less business capital there is, the higher the rate of return that remaining business capital earns, because each unit of capital serves more customers, as I noted last week. A low profit rate for housing is a symptom of its abundance. The profitability gap between nonresidential and residential capital shows that our economy was overinvested in housing, long before the housing boom of the early 2000s. Business taxes cause an underinvestment in business capital, and business capital has been so profitable to the economy because it is more scarce. Value added to the economy would have been greater if some housing investment had been invested in business instead; each $10 billion of housing investment redirected to business investment could have added almost a billion dollars to G.D.P. 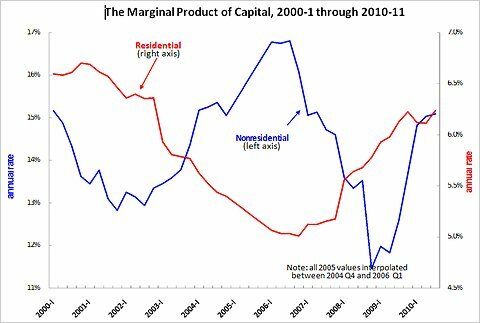 The chart below displays the same marginal product measure of residential capital profitability (red line, from the first quarter of 2000 to the third quarter of last year (Luke Threinen, a University of Chicago student, helped with these calculations). The chart also displays the marginal product of business capital (blue line). Because of the extraordinary “depreciation” from Hurricane Katrina, values for 2005 have been interpolated. The marginal product of residential capital is measured on the right axis, while the marginal product of nonresidential capital is measured on the left axis. By looking at the 2000-1 values – 6.6 percent for residential and 15.2 percent for nonresidential – we see the result, noted last week, that nonresidential capital was twice as profitable before taxes than residential capital. After the 2001 recession, and during the housing bubble, the marginal product of residential capital fell sharply. (This finding is related to previous findings that rent-to-price ratios were low during the mid-2000s, because housing profitability is essentially the rent-to-price ratio minus the expense-to-price ratio.) During this period, housing construction was booming. Housing was not particularly profitable during the housing construction boom – the market appears to have built so many new homes during those years because of an expectation that houses would be profitable in the future, and in part because home buyers were encouraged by easy credit. As a result, an ever-growing housing inventory was competing for much the same demand for shelter, which kept rents low and made vacancies high. While housing sector profitability became so low, business sector profitability was quite high. 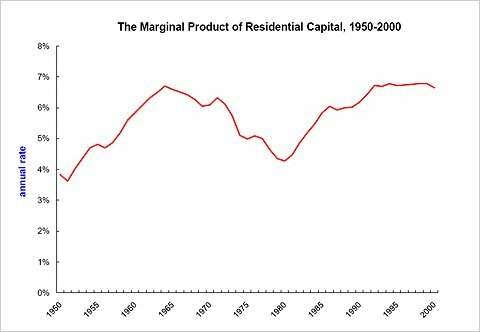 At the peak of the housing boom, the marginal product of nonresidential capital was more than triple the marginal product of residential capital. By widening the profitability discrepancy between the two sectors, the housing boom was more damaging than it would have been if the boom hadn’t begun with an abundance of housing. When the housing bubble burst in 2006-7, and housing construction nearly came to a halt, the marginal product of housing began to rise toward previous levels as the population grew into the extra housing, and some existing housing deteriorated. By the fourth quarter of 2009, the marginal product of residential capital hit 6.2 percent and has remained about there since then. The good news is that the 6.2 percent housing sector profitability of the past is actually a bit higher than the historical average from 1950 to 2000, which means that housing is adding value at a rate similar to the pre-bubble years. The strongest economic pressures preventing further increases in our housing inventory have been gone for a year now, which is one reason I do not expect the housing market to get any worse. Business capital profitability has also returned to previous levels, but the bad news is that housing capital remains much less profitable than business capital. In this sense, housing is still too abundant, an economic waste that shows no signs of repairing itself. This blog will be "feedburned" to the above twitter feed. (I think that means a copy is sent over there). In addition, twitter will have web links that I am saving for further reading. The original purpose of this blog was to keep notes on the economy -- help me remember rather than forget. A blog is still a fine way to do that when the notes are authored by me, but for book markers to notes/articles/etc by others it seems that reading and browsing software these days is makes a twitter post easier than a blog post. Some people, described in this article as "eager to work," found 1000s of jobs in construction. I have also done research on the recession-era employment rates of eager workers. Long before the housing boom, overbuilding effects of government policy were evident. A house is a piece of capital, meaning that it produces value over a number of years. In the case of housing capital, the value is in the form of shelter and the convenience of a home. As with any piece of capital, a home’s profitability (its marginal product, as economists call it) can be calculated as the dollar value it creates during a year – after subtracting depreciation, costs of labor, maintenance, and intermediate goods – per dollar invested. Owners of capital prefer their capital to be more profitable, rather than less. It’s the profitability of capital (after taxes and subsidies – more on those below) that makes an owner willing to purchase capital in the first place. For a home that is rented or vacant, the home profitability calculation is straightforward: take the landlord’s rental income for the year, subtract depreciation, costs of maintenance and labor expenses (if any) for the same year and divide by the amount the home is worth. A home occupied by its owner does not have rental income per se – the homeowner does not pay himself rent – but a hypothetical rental income can be imputed to owner-occupied homes by looking at the rental incomes earned by comparable homes that are on the rental market. The Bureau of Economic Analysis makes rent imputations part of its preparation of gross domestic product and other items in the national economic accounts and reports a total value created during the year by all homes. It also estimates an aggregate home value (more precisely, it estimates what it would cost to replace each home with one just like it). The table below shows its results for the year 2000. The first row of the table reports that the homes, condos and mobile homes in the United States in the year 2000 provided $1.01 trillion of housing services — that is, the value of the housing in rent or imputed rent — in the year 2000 (next week I’ll examine the years 2000 to 2010 more closely). A total of $160 billion of intermediate goods and services — mainly closing costs and brokers’ fees — were used, and the normal rate of depreciation of homes amounted to a cost of $162 billion. The housing sector employed some people, such as apartment managers, with a payroll that amounted to $11 billion. But the Bureau of Economic Analysis does not try to measure the value of time of people who maintain their own homes, and for this reason the housing sector’s labor costs are significantly understated. With this caveat, the operating surplus of the housing sector was $677 billion. The housing stock in the year 2000 was worth $10.63 trillion, so the housing sector’s operating surplus amounted to 6.4 percent of the value of its housing capital. (This surplus was divided among owners and mortgage lenders, but today I focus on the overall profitability of capital without regard to how it is shared). Luke Threinen, a University of Chicago student, and I used these ingredients, and some minor adjustments for inflation during the year, to calculate housing profitability rates for 80 years. The chart below displays our results for the years 1950 to 2000. The profitability of housing fluctuated between 4 and 7 percent, averaging 5.7 percent over the decades shown in the chart. The 5.7 percent may seem large, because few of us earn that much on our savings accounts. Part of the explanation is that most homes owe property tax, and the chart shows pretax profitability (another part of the explanation is that savings accounts are generally low-return investments). More notable is the comparison of housing’s 5.7 percent profitability to the profitability of business capital. Mr. Threinen and I made analogous calculations for the nonresidential sector – annual business revenue minus variable (nontax) costs expressed as a percentage of the amount of business capital – and found business capital to have a profit rate of 15.3 percent. We concluded that the profitability gap between nonresidential and residential capital shows that our economy was overinvested in housing, long before the housing boom of the early 2000s. Business capital has been so profitable to the economy because it is more scarce. It’s the law of demand: the less business capital there is, the higher the rate of return that remaining business capital earns because each unit of capital serves more customers. A low profit rate for housing is a symptom of its abundance. With each dollar of business capital adding 15.3 cents of value per year and each dollar of housing capital adding only 5.7 cents, total value added in the economy would have been greater if some of the housing investment had been business investment instead, even before the housing boom. Each $10 billion of housing investment that could have been redirected to business investment have added almost a billion dollars to G.D.P. Business capital has been more scarce largely because of business taxes and housing subsidies. Houses are not tax-free — I mentioned the property tax — but, in addition to property taxes, investors in businesses also owe sales taxes, corporate income taxes and personal income taxes. The business-residential profitability gap is almost 10 percent, but our attempts to adjust both profit rates for applicable taxes show that the after-tax profitability gap is zero to five percentage points. I mentioned last week how, in the short run, capital income taxes result in lower after-tax returns for the owners of the capital being taxed. In the long run, the opposite occurs: investors have choices about where and how to invest, so the after-tax profitability of housing has to be pretty close to the after-tax profitability of business. Business taxes cause an underinvestment in business capital – scarcity is the only way business capital can earn an after-tax return that compares with the return on lesser-taxed housing – and overinvestment in housing. By its very name, the 2009 American Recovery and Reinvestment Act was advertised to increase investment. Yet years before this stimulus act was proposed, Austan Goolsbee, now chairman of the President’s Council of Economic Advisers, explained in his doctoral dissertation how investment tax credits might do little to stimulate investment during the life of the credit. In at least one respect, the results of the act appear to confirm his theory. An investment tax credit permits someone who purchases one of the capital goods covered by the credit to pay less tax in proportion to the amount he spends on the investment. The 2009 stimulus act included tax credits for various capital items, the most publicized being homes: qualified first-time home buyers, for a limited time, received a 10 percent capped tax credit. The program was later expanded to include repeat home buyers. With the government helping an investor pay for a capital good, each investor is more willing to pay for such goods than he or she would be without the credit. You might guess that eager investors would stimulate more investing – leading to the production of more capital goods. With more capital goods being produced, the credit would create jobs for people who make those goods. This guess is correct in the long run when it comes to housing tax credits: a housing credit or subsidy does result in the building of more houses (I’ll explore this subject in more detail next week). With no additional capital goods being produced, the credit would not create any jobs – just create a windfall for people already making those goods. Mr. Goolsbee’s study looked at equipment and not structures, and we cannot assume that the nature of housing supply is identical to the nature of equipment supply. Economic theory and experience suggest that housing is even less elastically supplied in the short run than is business equipment. In other words, an increase in housing demand – which the tax credit helped create – would, in the short run, do more to make housing construction expensive, less to create houses and less to create jobs than Mr. Goolsbee found for equipment. And, indeed, whatever the overall objectives of the stimulus bill, it appears to have made construction more expensive. I do not know if President Obama’s advisers discussed this issue, or whether they expected job creation to come from other parts of the stimulus act. White House economists are probably Keynesian, in the sense that they believe that the 2008-9 recession was a special time when supply did not matter, even though it normally matters in most economic circumstances. Mr. Goolsbee’s dissertation examined a number of tax credits that were put in place during recessions and seems to refute the idea that supply doesn’t matter during recessions. Yet we have to acknowledge that the home construction industry was unusually depressed in 2008-9 and might have been a rare example where a stimulus could create jobs without increasing prices. Now that the Home Buyer Tax Credit has come and gone (it began in early 2009 and ended April 30, 2010, although some buyers had until September to finish transactions), we can look at home construction costs and home construction activity during that period. The chart below displays the monthly producer price index for home building materials (the blue line, measured relative to the producer price index for all finished goods), along with employment in the residential building industry (the red line), for the period January 2008 through December 2010. 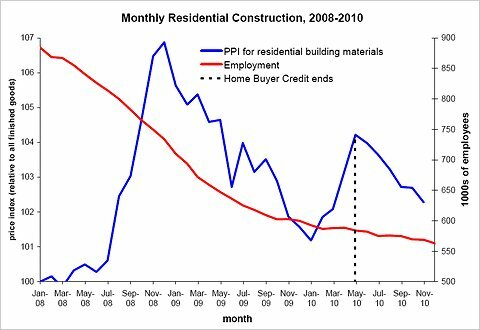 The blue line shows a curious spike in the prices of home building materials, peaking at the end of April 2010, almost exactly when the home buyer credit expired. Perhaps Mr. Goolsbee’s dissertation applies here, and the rush to finish home transactions before the credit expired made home building 3 to 5 percent more expensive during that period than it would have been without the credit. In contrast, the red employment series shows no visible spike in people employed as home builders. The Home Buyer Tax Credit is just one part of a complicated stimulus law, but it illustrates a general principle of economics. Even when government spending, subsidy or credit is targeted at a highly depressed industry, with plenty of unemployed workers apparently available for hire, the government’s purchases may, in the short run, raise prices and costs without necessarily causing more of those items to be produced. Bad News from the Housing Sector? A few economists are contending that our housing market is now in a “double dip,” based in part on last week’s report of housing price indexes for September and October that were lower than they were during the summer. 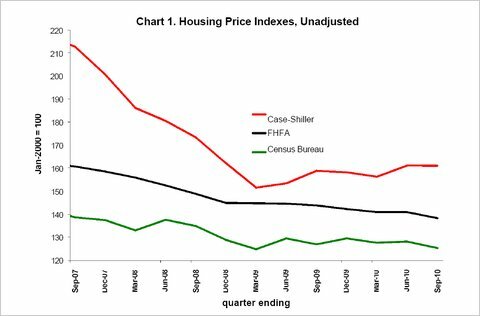 In my opinion, the data on housing prices and construction do not show any significant housing market change during the second half of 2010. 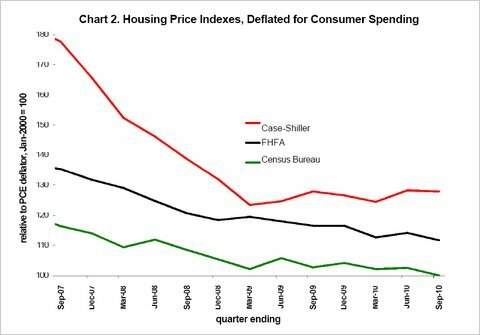 When connecting the housing sector with the wider economy, three different measures of housing prices are helpful: inflation-adjusted housing prices, inflation-unadjusted housing prices and cost-adjusted housing prices. Inflation-adjusted housing prices tell us how much the prices of homes have changed relative to the prices of other consumer goods. If, for example, we want to know whether demand for housing these days is any different than it was before the housing bubble, it helps to check whether, from the 1990s through 2010, housing prices failed to increase as much as other prices have. In this case I look at a housing price index that has been normalized by a consumer price index. Inflation adjustments are not appropriate for the purposes of analyzing foreclosures – a big drag on our economy – because the mortgage principal that pulls homeowners “under water” is not adjusted for inflation either. If unadjusted housing prices increase, even if more slowly than other consumer prices, that helps homeowners swim out of the water. For this purpose, I look at an index of the dollar value of housing properties, without any adjustment for inflation. For the purposes of understanding construction activity, it helps to know whether housing prices have increased more than the costs of building materials. The more that housing prices increase beyond the cost of materials, the more value that can be created by home construction activity. 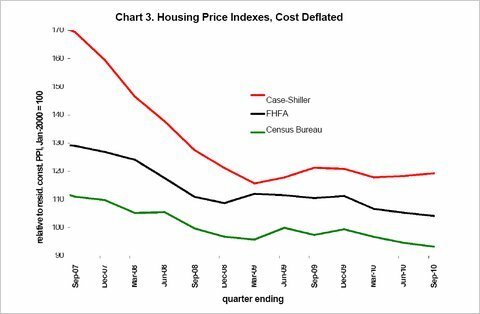 For this purpose, I look at an index of housing prices that has been normalized by an index of building costs. It turns out that practice is messier than theory, because there are so many different houses in America and many different price trends. In practice, it matters which housing price index is used, regardless of which inflation or cost adjustment is used. The Case-Shiller repeat sales index is one such index of existing homes. The Federal Housing Finance Agency has another index of existing homes (and there are others, as well). The Census Bureau has a quality-adjusted index of new home prices. Chart 1 displays the three aforementioned home price indexes, measured quarterly without any inflation adjustment. The Case-Shiller index for the third quarter of 2010 (the first quarter without the government’s home buyer tax credit) was essentially the same as in the previous quarter. The other two indexes show slight decreases over the same time period, although well within the range of ups and downs over the previous six quarters. By themselves, these data suggest that homeowners did not go significantly deeper under water in the third quarter and that the housing market trends were not dramatically different in the third quarter than in previous quarters. Chart 2 displays the same three indexes, adjusted by the implicit price deflator for consumer spending. Because inflation has been low recently, it shows a similar pattern to Chart 1. By themselves, these series show no dramatic change in housing demand over the most recent quarter. Chart 3 displays the same three indexes, adjusted by the producer price index for home building materials. Deflated this way, the Case-Shiller index actually shows a housing price increase from the second to the third quarter. That’s because building costs peaked in May and have been lower since then. Without home prices falling by this measure, we do not expect construction activity to be lower than it was during 2009 (but, unsurprisingly, lower than it was during the short rush to sell homes before the tax credit expired). You may notice that various housing price indexes disagree, and our most recent data is still three months old. 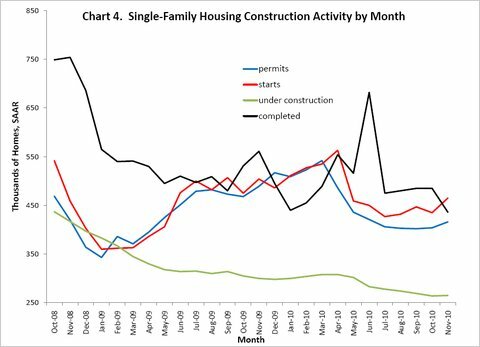 Yet another approach is to look at home construction activity. Chart 4 displays monthly home construction activity through November 2010, measured as the number of housing permits, housing starts, homes under construction and homes completing construction. Permits and starts are particularly interesting, because homes take time to build and we presume that many builders are looking ahead to the prices homes will command in the future, when the construction project is complete. Those series were actually higher in November 2010 than they were for several months before. Predicting the future is difficult, but the price and construction data so far do not seem to suggest that home values will be significantly different this year than they were in 2010. I've heard some complaints about my seasonals article: that I should have looked at the impact of Christmas value-added rather than Christmas spending. If the complaints prove anything, they prove that Keynesian theory has not yet progressed beyond a statement of faith to a theory that might actually be tested. First of all, this complaint is a great example of slippery Keynesian rhetoric. We have been told time and time again that the recession and sluggish recovery are to be blamed on too little consumer spending. We can and should help fix it -- create millions of jobs, they claim, with trillions of dollars of government spending. They even claim that unemployment insurance (UI) -- a transfer that is normally expected to reduce employment -- would, these days, increase employment because UI is spending. In summary, the Keynesians say that spending really matters during a recession, and that employment, value-added, etc., would be the result of that sorely needed spending. Now we're told that value-added is supposedly what's missing, not spending. So what happens to consumer spending in December is, all of the sudden, no big deal, because most of the December action is purportedly spending rather than value-added. You might think that I'm being too harsh with the Keynesians because, after all, they are trying to explain economics to politicians and laymen who might be overwhelmed by a term like "value-added", so the Keynesians say "spending" when they really mean value-added. But UI is an excellent example for sorting this out, because we all agree that UI is spending, but not value-added (UI actually pays people for not adding value!). So Christmas consumer spending should create as least as many jobs per dollar (probably more, for the incentive reasons I mentioned in my earlier post) than a UI program does. Second of all, in claiming (without evidence) that the retail sales seasonal is very different from the value-added seasonal, econbrowser probably has the facts wrong. Professor Jeffrey Miron has written a book about the seasonal cycle, and reports that value-added falls sharply from the fourth quarter to the subsequent first quarter -- very much in line with the drop in retail sales. The value-added of Christmas is not all that different from the spending. Third, I do not doubt that December retail sales are associated with some significant production in November, and October, and maybe even with some significant production in the 3rd quarter. But both of my recent posts on this topic repeatedly reference drops FROM DECEMBER TO JANUARY. At lot of the seasonal jobs lost at the end of the year include those that started in October and November, so in making December-January comparisons I do not have to assume that all of the employment and production associated with December spending occurred in December. Keynesians are understandably nervous that the seasonal cycle appears to contradict the most fundamental tenets of their theory. Many of them really do think that government spending is as good as Christmas.